Meet Harold Fry, recently retired. He lives in a small English village with his wife, Maureen, who seems irritated by almost everything he does. Little differentiates one day from the next. Then one morning a letter arrives, addressed to Harold in a shaky scrawl, from a woman he hasn't heard from in twenty years. Queenie Hennessy is in hospice and is writing to say goodbye. But before Harold mails off a quick reply, a chance encounter convinces him that he absolutely must deliver his message to Queenie in person. In his yachting shoes and light coat, Harold Fry embarks on an urgent quest. Determined to walk six hundred miles to the hospice, Harold believes that as long as he walks, Queenie will live. 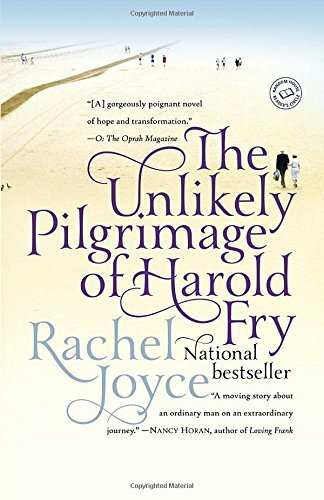 A novel of charm, humor, and profound insight into the thoughts and feelings we all bury deep within our hearts, The Unlikely Pilgrimage of Harold Fry introduces Rachel Joyce as a wise--and utterly irresistible--storyteller. I read this nearly 5 years ago (has it been that long?? ), and really enjoyed it - I still think about the story, which I think is good sign! It is sentimental without being soppy, and a lovely tale of friendship & new beginnings. This copy sourced via Better World Books is on its way to another BCer - I hope you enjoy it too. As always on my birthday - you do spoil me! And as we have a tendency to enjoy the same books, I'm sure I'll like this one as well. A lovely story about love, friendship and seeing the best in people. Harold goes through a wonderful journey where he has the chance to reflect over what life has been like, and what life might become. We might all need a journey like this in life? Alas, it is not only about Harolds changing view on life, but also how his journey effects everyone he meets on the way, to some sort of degree. A lovely read, thank you for passing this little gem on to me. Purrrr! This looks like a really good book.